The longest common sub-sequence problem is a classic computer science problem, the basis of data comparison programs and has applications in bioinformatics. The longest common sub-sequence (LCS) problem is to find the longest sub-sequence common to all sequences in a set of sequences (often just two). First we look into only finding the length of LCS. We can easily construct an exponential time recursive algorithm to compute the length of the LCS. But using Dynamic Programming (DP) to compute the solution bottom up the same job can be done in O(mn) time where m and n are the lengths of the sub-sequences. Here is a C code to do so. 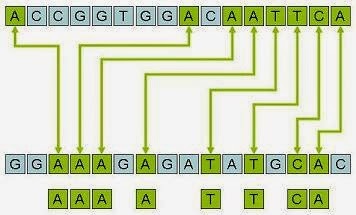 Longest Common Sub-sequence (LCS). In computer science we use dynamic programming for solving complex problem. A good example for dynamic programming is longest common subsequence. Dynamic programming is a method for solving a complex problem by breaking it down into a collection of simpler subproblems.